NETWORK FINALS: The reruns of LAST MAN STANDING and DR KEN both gained 0.2 in final numbers, and the AMERICA’S GOT TALENT rerun lost 0.1. CABLE HIGHLIGHTS: Adult Swim’s late-night animated slate took Saturday cable, with DRAGON BALL Z up 0.05 to 0.71/1.666M, but ONE PUNCH MAN down 0.04 to 0.63, MOBILE SUIT GUNDAM down 0.09 to 0.47, HUNTER X HUNTER down 0.07 to 0.39/914K, NARUTO down 0.11 to 0.33/795K, ONE PIECE down 0.12 to 0.27/658K, and PARASYTE down 0.08 to 0.24/590K. Spike’s original COPS climbed 0.05 to 0.40, and JAIL: BIG TEXAS was up 0.03 to 0.35. On HGTV, HOUSE HUNTERS RENOVATION rose 0.02 to 0.39, and BEACHFRONT BARGAIN HUNT was steady at 0.34. 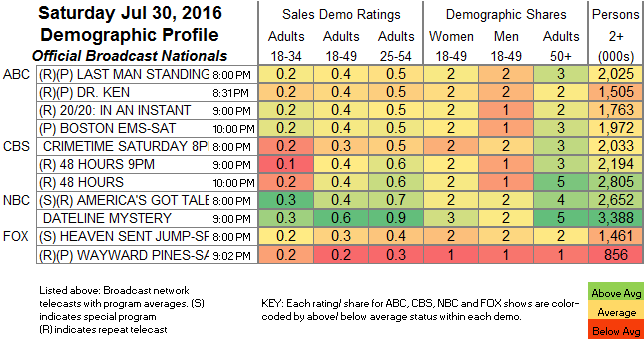 Lifetime’s original movie KILLER COACH was at 0.32, and Hallmark’s FOR LOVE & HONOR was at 0.26. Nickelodeon had 2 shows in the Top 10, NICKY, RICKY, DICKY & DAWN up 0.09 to 0.31, and THUNDERMANS up 0.03 to 0.30. 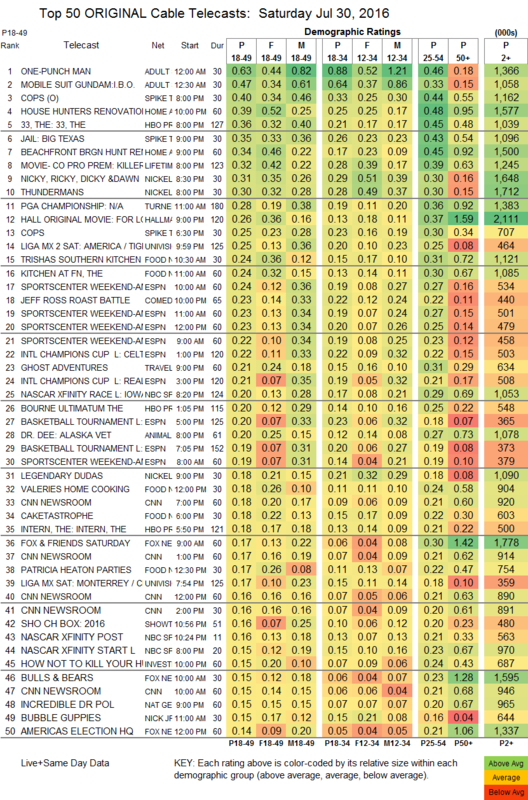 TNT’s PGA CHAMPIONSHIP coverage led sports at 0.28. On Food Network, TRISHA’S SOUTHERN KITCHEN and KITCHEN AT FN were both at 0.24. Comedy Central’s ROAST BATTLE was at 0.23. AMC’s THE AMERICAN WEST ended its season down 0.02 to 0.14.